"We used to lie on the bridge and look down underneath... and the whole sides..both sides..used to be literally one solid mass of black...thousands and thousands of little elvers,"
Some Sussex people, like Maureen Oakley, can remember days when the rivers would be thick with the wriggling bodies of tiny elvers. Those days are over, at least for now. The eel is in decline and no-one is quite sure why. They grow to maturity in rivers and can live there for ten years before going back to the Sargasso to spawn. A research station at Pevensey in Sussex is part of an international effort to find out what the cause might be. Experts like Jane Birch are are counting the eels that pass along the river. She's not happy. "We've got 226 today. Ten years ago we'd have a seething mass of about ten thousand," she said. The reasons for eel decline are not clear; climate change, alterations in sea currents. It is a European problem and there is now a ban on fishing for juvenile eels until February of next year in an effort to stop their complete disappearance in English waters, with a maximum fine of £50,000 for those who break the rules. It follows a 2009 recovery plan from the European Commission. The EC required all countries to create "eel plans" for their river basin districts which would allow recovery and its sustainable use for food, and ensure that enough adult eels would make the journey back to their spawning grounds. It was supposed to ensure that all EU countries reserved a certain number of eels for conservation and restocking work across the 27-nation bloc, but some countries have not followed this part of the plan. 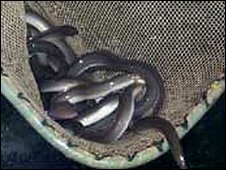 Away from Sussex, the eel population in the River Thames is reported to have dropped by up to 98% in the last five years. Earlier this year the East End boxer Kevin Mitchell announced that he was giving up jellied eels - a traditional East London dish - ahead of his clash with Spaniard Ignacio Mendoza. 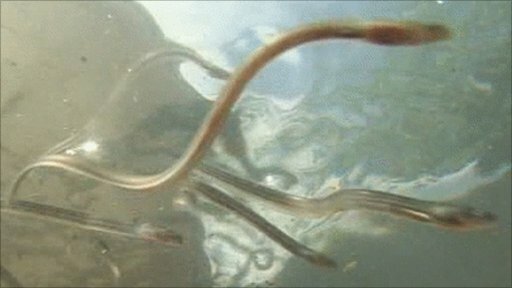 "All the cockneys out there who love eating eels need to cut down a bit to sustain the population, me included, " he said.